Lock in a great price for Hyatt Regency Sharm El Sheikh – rated 8 by recent guests! I have been coming to Sharm since 1987. I have stayed in many hotels here and around the world. This place was incredible! What really got me was the architecture and layout of the hotel. I was also very impressed with the repaectful service and how the staff was discreet and quite when talking with guests and to other staff (mostly). Everything! The hotel planning and architecture are excellent and many routes to get from point A to point B, its amazing this place is almost 20 years old now. The view from the reception to the sea front rooms are all special. Location is wonderful; sea excursions from other locations come in front of the hotel for the view underwater which you can see for free! And the boats are not so close that they cause a disturbance to the hotel guests, on the contrary, they add to the overall excitement of being on the beach. The thai restaurant is amazing! The shows in the souk restaurant at night are classy and entertaining. Overall a great experience and I look forward to be back as soon as possible. Excellent location, very nice pools, good in house services and helpful staff. Hyatt Regency Sharm El Sheikh This rating is a reflection of how the property compares to the industry standard when it comes to price, facilities and services available. It's based on a self-evaluation by the property. Use this rating to help choose your stay! 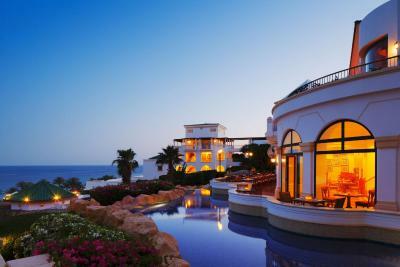 This luxurious 5-star resort in Sharm El Sheikh is set in landscaped gardens and lagoon-style swimming pools. Featuring 3 private beaches, it has a spa, shops and 5 restaurants. It offers free WiFi throughout the hotel. Furnished sea-view balconies are standard in all rooms at the Hyatt Regency Sharm El Sheikh. Each comes with a soaking tub, walk-in shower and deluxe bath amenities enriched with Dead Sea minerals. Massages can be enjoyed at the spa. The Club Olympus Fitness Center features squash and Tennis courts. For younger guests there is the Oasis Kids’ Club, and children’s pools. Snorkeling activities are available upon request. The 5 restaurants at the Hyatt Regency Sharm El Sheikh serve local and world cuisine. Meals can be enjoyed indoors, as well as outdoors by the pool, overlooking the Red Sea. It offers free airport shuttle service for domestic flights. Sharm El Sheikh International Airport is a 10-minute drive from Hyatt Regency Sharm El Sheikh. Naama Bay is 10 minutes by car. When would you like to stay at Hyatt Regency Sharm El Sheikh? Featuring premier views of the Red Sea from a furnished private balcony, this elegant Mediterranean-inspired decor room offers two twin beds with the softest Egyptian cotton linens, a work area with free WiFi and a spacious marble bath featuring a soaking tub, walk-in shower and deluxe bath amenities enriched with Dead Sea minerals. Featuring stunning sea views from a private balcony, this Mediterranean-inspired decorated room offers rich amenities including a king-size bed, free WiFi and a marble bath with a soaking tub, a walk-in shower and deluxe bath amenities. It Includes access to a Club House offering secluded beach, gardens, a private swimming pool and whirl pool. - Exclusive access to the Regency Club Lounge, beach and swimming pool. - Exclusive access to our “Family Lounge” with flat screen TV and board games. - Exclusive check-in and check-out service for Regency Club guest only. - Free High speed roaming wireless internet access available within the lounge. - Concierge and restaurant reservation service. - Regency club welcome and in the room amenities. - Complimentary continental breakfast in the lounge from 07:00 AM to 11:00 AM Daily. - Complimentary beverages and canapés during our cocktail buffet in the lounge from 17:30 Pm to 19:30 pm. - Complimentary soft drinks and water at the Regency Lounge, pool and the beach from 11:00 am to 17:00 pm daily. - Complimentary pressing service for one outfit on arrival. If express service is required, regular rate will apply. Offering stunning views of the Red Sea from three furnished balconies, this Mediterranean decorated room features a large living and dining area, a deluxe marble bath, king bedroom and work area offering free WiFi. It Includes access to a Club House offering secluded beach, gardens, a private swimming pool and whirl pool. Offering stunning views of the Red sea from a 26 square yards terrace, this suite offers Mediterranean inspired décor. It features a large living area, three bathrooms, a kitchenette, two bedrooms and a work area with high speed internet access. Includes access to a Club House offering secluded beach, gardens, a private swimming pool and whirl pool. - Please note that from 5:00pm, a dress code does apply. Featuring views of the Red Sea from a furnished balcony or terrace, this Southern Mediterranean decorated room offers one king or two twin beds, a work desk with free WiFi and a marble bath with a soaking tub, a walk-in shower and deluxe bath amenities enriched with Dead Sea minerals. This villa suite offers stunning views of the Red Sea from two furnished balconies. Mediterranean-inspired decor features a large living area, two baths, king bedroom and a work desk with high-speed Internet. It Includes access to a Club House offering secluded beach, gardens, a private swimming pool and whirl pool. House Rules Hyatt Regency Sharm El Sheikh takes special requests – add in the next step! Hyatt Regency Sharm El Sheikh accepts these cards and reserves the right to temporarily hold an amount prior to arrival. All children under 6 years stay free of charge while using extra beds. Please inform Hyatt Regency Sharm El Sheikh of your expected arrival time in advance. You can use the Special Requests box when booking, or contact the property directly using the contact details in your confirmation. Close to beach. Easy to go diving. But liveaboard more value. We did stay a couple of days here and then liveaboard. After that another hotel. The furniture was old and needs to be renovated. Breakfast could be better. Check in took a long time although i was alone. Some of the activities made recently for entertainment are cheap quality and does not suit the level of Regency chain. 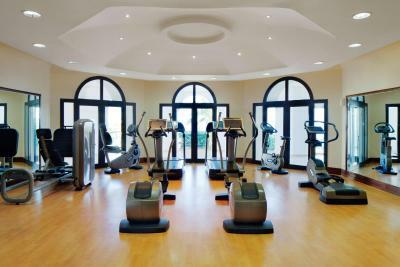 Fitness room is small and has limited equipment. Red sea Diving center is located in the hotel with professional instructors. The beach is one of the best for snorkling and scubadiving. The sea view from the room is wonderfull. Property is in very much need of maintenance. Buffet at night is poorly, food is not nice. Beautiful view, fantastic pool. Breathtaking coral. Now for the downside. The food is the main let down here. The Souq restaurant it’s an absurdity. They give you 30 coins which you can exchange for food from the different stations. However, everything that is nice to eat costs more than 30 coins, meaning that you end up paying extra to have dinner there (and I don’t find it nice considering that we had the half board option included). The Thai restaurant was OK, but we had to wait more than 30 minutes between the starters and the main course. By the time we got the food, we were not hungry anymore. The main restaurant which offers a buffet was terrible. Food quality and variety was poor, VERY POOR. It was so bad that my boyfriend ended up eating white rice and bread for dinner. This is not what you expect from a 5* hotel. Overall, we had a wonderful time enjoying the beach and the surrounding area and we would love to visit here again if the hotel improves the quality of the food. We recently stayed at the Hyatt for 3 days. We opted for the Regency Club and it's definitely worth it. That extra service and details really upgraded our stay. The Regency Club has an evening happy hour period for two hours that starts at 5:30 with snacks, soft drinks and alcohol options. It’s a nice arrangement. In addition, it has an exclusive beach for the club members which we considered to be much more beautiful and quieter than the main one. Again, you have soft drinks included all day long on the private beach. Beach is great and perfect for snorkeling; clear water and beautiful coral reefs. The private pool for the Regency Club members is also great. The other guests were quiet and considerate, so was perfect for relaxation. The hotel itself is very well maintained from gardens, rooms, beach… Design and landscaping could not be faulted. Service was nice, everyone was respectful and professional. Nothing. Our only regret Sharm is really suffers from the lack of Russians. But this is nothing to do about the hotel. We all do feel for you, sincerely and hope it ends soon. Great hotel, clean, elegant, well kept. Tremendous garden care, astonishing in a desert. Everyone was at the hotel was friendly and helpful. Many thanks to reception, restaurant, gym guys. All of them were extremely nice and hospitable. And our special thanks to room cleaner (5205) who found and immediately brought to us IPhone6 we had forgotten while changing the room. Great work! Thank you ever so much! Normally the resort is perfect the content of rooms are little old like beds and bathrooms and in our room there was insect , there is no kurdish channal in tv there is tv channal for most if the nations but for kurd no ,. Not a big range of restaurants. Not the fault of the hotel, but way too much smoking in all parts of the hotel including the restaurants! Another thing, I asked for a non-smoking room at check-in and was given a smoking room on the 3rd level. Great room overlooking the Sea. When I asked to change rooms I was given a non-smoking but on the 5th level which Did not have as good a view (building blocking a small part).